Folwell Running Club, a spring favorite, is coming soon! 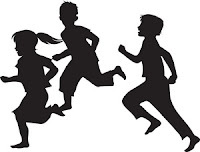 Spring Running Club will be held Monday-Friday April 16 - May 25th, 8:40-9:00 am. We’ll help kids track miles, award prizes, and get some exercise outside before school! To sign your child up, look for the permission slip after spring break. Volunteers are needed to help with running club! To volunteer, please visit www.folwell.info and “click to volunteer.” Running Club is a great way to start the day outside and get some exercise. Kids love it, and teachers report better concentration and fewer behavior issues when kids exercise before school.